As someone working in a world full of grey areas and subjective judgements, I have always had an awestruck envy for the possibilities of scientific certainty. My own knowledge of science is minimal, little more than a dim memory of physics-with-chemistry at my convent school, which means that I opened Nobel-prize-winning Steven Weinberg’s history of science with some fear. I need not have worried. While the technical notes are beyond me, his main narrative is entirely comprehensible – and fascinating. Weinberg introduces us to the quest to explain the world by describing the observations and speculations of the ancient Greeks, showing how they arrived at their ideas and where (and why) they got them right or wrong. From them he moves on to the Hellenstic thinkers of Alexandria two centuries before Christ, then the Arab scientists of the Caliphate of the Abbasids, through the Dark Ages when so much learning was forgotten, and eventually to the great flowering of scientific thought and experiment in the seventeenth century, and so to the modern world. On the way he offers many intriguing insights. 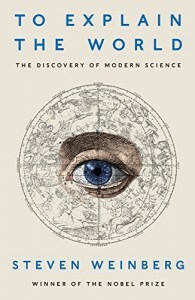 I was particularly interested in the origins of the intellectual snobbery that values theoretical science so much more highly than practical technology, and the way in which religion has stifled scientific thought from the beginning. 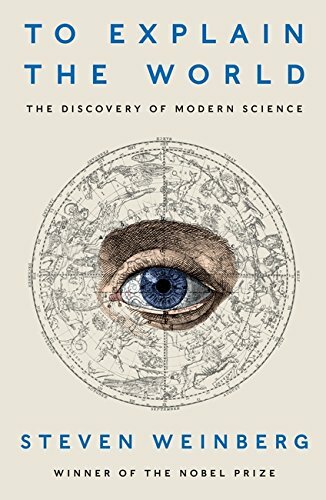 I found huge delight in Weinberg’s explanation that, ‘a simple and beautiful theory that agrees pretty well with observation is often closer to the truth than a complicated ugly theory that agrees better with observation.’ But I was disappointed to see at last how there is no certainty, even in science. Mathematical proofs, experiments and observation have established a great deal, but there is much yet that is not understood. String theory, for example, is very beautiful but it cannot yet be proved to apply to the real world. Towards the end of this engrossing journey through the development of scientific thought, Weinberg points out in a discussion of quantum field theory that ‘The Standard Model… is impersonal; there is no hint in it of human concerns like love or justice. No one who studies the Standard Model will be helped to be a better person…’ And so I return with some relief to my own world, which deals with exactly that, but I have been enriched by the quite different and unemotional ideas that Weinberg describes with such clarity.